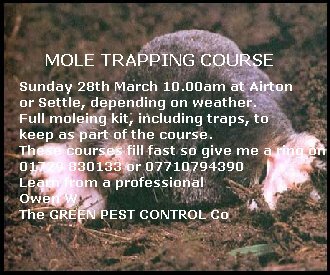 Article By Pest Control and mole trap expert Owen W of The GREEN PEST CONTROL Co. Owen is 100% recommended by GardenAction and as a supplier of mole traps and general mole control. As with all pests moles are only pests if they are causing a problem either physically or aesthetically. If there is not a problem they should be left to their own devices. This article will let you know which mole traps and control methods are effective and legal for the homeowner. It will also take a fresh look at some of the old wives tales on mole control and give you informed opinion on them. There are only 4 methods of controlling moles that work, poison, gassing, trapping, and sonic probes. Green Pest Control Company website. I have tried each of them personally and they work. The prices on the website are the price you pay - there is no postage charge. In some cases gas pellets are used. These pellets are a soluble Aluminium phosphide concoction that reacts with the damp in the soil, however gassing does not achieve the same level of eradication as strychnine; most gasses dissipate in to the soil unless it is a very heavy clay. I have been led to believe the mole goes to sleep with this method of control, I like to think this is the case. I should add that gassing and strychnine control are restricted to professional use only. In the garden we are left with two effective method of mole control, mole traps and sonic control. Scissor trap There are 3 main types of mole trap, the scissor, barrel and live catch traps. My preference is for the scissor type of trap, I achieve about an 80% success rate using these traps but they all work if set correctly. If you are using the live catch type the captured mole must be dispatched humanely. I don�t like releasing the moles to another area where the mole could be up against established and very territorial resident moles. On the other hand, if you release them to an area where there are no resident moles, the question must be asked is there a shortage of mole food? 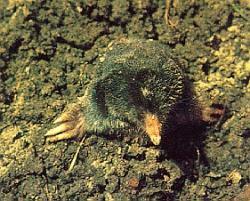 Moles need to eat between 60 - 200 worms a day, they will also take the odd chafer grub but the main diet is earthworm. They store their food in mole larders but first they bite the heads off the worm. I have looked at worms very closely and I found it hard to know which end is which, but moles know even in total darkness! Before using a mole trap for the first time bury it in the garden for a week to remove the 'new' smell, and remember don�t have perfume, disinfectant or other strong odours on your hands - moles have a great sense of smell. I don�t wear gloves when setting traps, because most gloves have a strong smell. Don�t forget to mark where you buried the trap, it is surprising how many traps never get used because we forget where we buried them, I have lost dozens over the years! Let�s assume we are using a mole scissor trap. These are the easiest to set and can normally be checked to see if they have been tripped without removing them from the ground. By the same token they are open to vandalism. Remember not everyone likes to see moles controlled. Locate the mole run using a long probe, an old knitting needle is ideal (I use a thin screwdriver). Start to probe the ground until the soil "gives" indicating a run, normally within 12 inches of the freshest molehill but not in it. Old molehills can be recognised because they will have weeds growing through and from them, also the grass below the hill will be light coloured. It is important that you do not put the mole trap in the mole hill. With an old knife cut the sod to remove a piece the size of a saucer, being as clean as possible and trying to avoid soil going into the mole run. If soil drops into the run the mole will push it forward and trip the trap. When you find the run, position the mole trap, replace the sod you removed around the legs of the trap, excluding as much light as possible.